Feel better. Mental health is science. Let’s start with the basics. This interactive workshop is for teens ages 13 to 18. 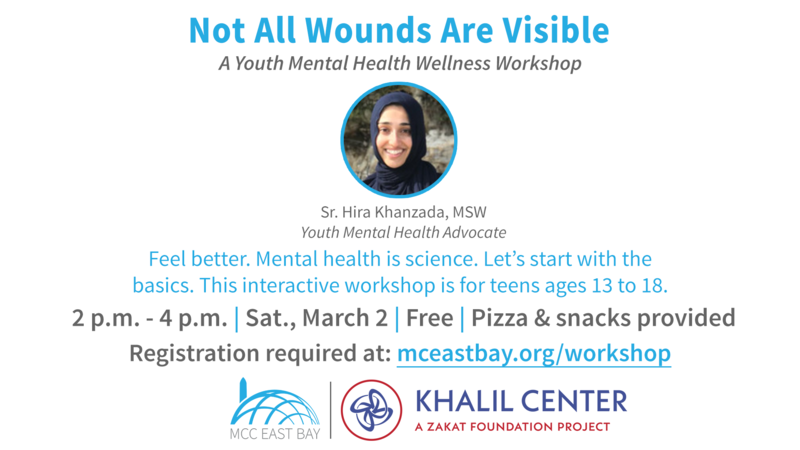 Join Sr. Hira Khanzada, MSW and a youth mental health advocate, for this youth wellness workshop. Private session in Conference Room. Please no parents in during youth session. Too often, young people’s lives are derailed by mental illnesses. Life gets hard at a time when the future should shine brightest. About one-third of students with mental health issues drop out of school. Sometimes, mental symptoms go away after a while; sometimes, they don’t. It’s important to get help in either case. Learning about mental health is the first step to wellness.